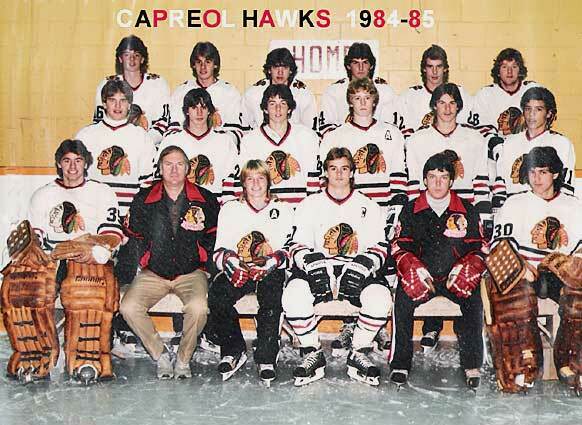 For coach Joe Clancy, he wishes his Capreol Midget Hawks could always play a spirited hockey game for a full 60 minutes. Hawks put on an impressive show­ing and as a result pulled out a 7-6 victory over the Roserberg-Arlanda RA-73 hockey club of Marsta, Sweden, in the second of a four game exhibition series at Capreol Arena last night before a capacity crowd of over 1,000. "It was an excellent hockey game." said Clancy. "I'm proud of the way my team came back the way they did. "Sweden is a good skating club and move the puck extremely well," he added. "They were froced to play our style of game from the start. Had we not stuck to our game plan from the start, we could have been in trouble early." It was by far the best showing by Hawks this season, currently playing under the .500 mark in the Nickel District Hockey League, good for fifth spot. RA-73 also put on a memorable show, despite coming out on the los­ing end and victory could have easily been in their favor. RA-73 secured the lone goal of the opening period when Mikael Nylander combined with teammate Patrick Schulat at the 5:13 mark. Peter Dergane tied the score at the 1:00 mark of the middle frame but Tony Wennstrand pushed RA-73 ahead by one once again, 38 seconds later. Keith Allen tied the score again six minutes later to complete the goal production for the second frame. 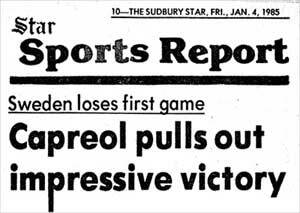 later Capreol had tied the score again thanks to a goal by Brad Jones. Allen, with his second of the night, pushed Hawks ahead for the first time at the 6:31 mark but the best was yet to come. Goals came in a flurry after that with six in total coming within a span of 5:06, three by each club. At the 12:47 mark, Mike Auger pushed Hawks ahead by two but Stefan Engstrom narrowed the gap with a powerplay marker. However, it didn't take long for Hawks to pad their lead once again as Trevor Colburne slid a shot past netminder Thomas Sweden, just seven seconds after the Engstrom goal. Two goals within 11 seconds by Schulat and Blomqvist, with his se­cond of the ngith, brought Sweden to even terms but Greg Menard's scored the eventual winner with just 2:07 remaining in regulation time. Sweden had a chance to tie it again with just 60 seconds remaining, but Hoshko robbed Blomqvist from point blank range with s spectacular glove save. After that, Hawks pressed Sweden in its zone, unable to pull Sweden for the extra attacker. Referee Ken Protulipac had a fairly easy time, assessing 12 minor penalties including seven to Capreol. Sweden is now 1-1 in exhibition play, having earlier beaten Sudbury Lanteigne Lakers 3-1 in a contest played Wednesday. Sweden will play its third exhibition contest tonight at Carmichael Agena beginning at 9 p.m. against Sudbury Steelworkers of the Sudbury Minor Hockey Association. They face Steelworkers again tomorrow at Bell Brove Arena beginning at 6:30 p.m. before returning home Sunday.